Lauren Cohan (The Walking Dead, Chuck): Born in Philadelphia but raised in Cherry Hill and later the United Kingdom, Lauren Cohan is most well-known for her role as Maggie Greene on AMC's The Walking Dead and Rose on the CW's The Vampire Diaries. 'It's really about getting into a rhythm. The key is the angle." 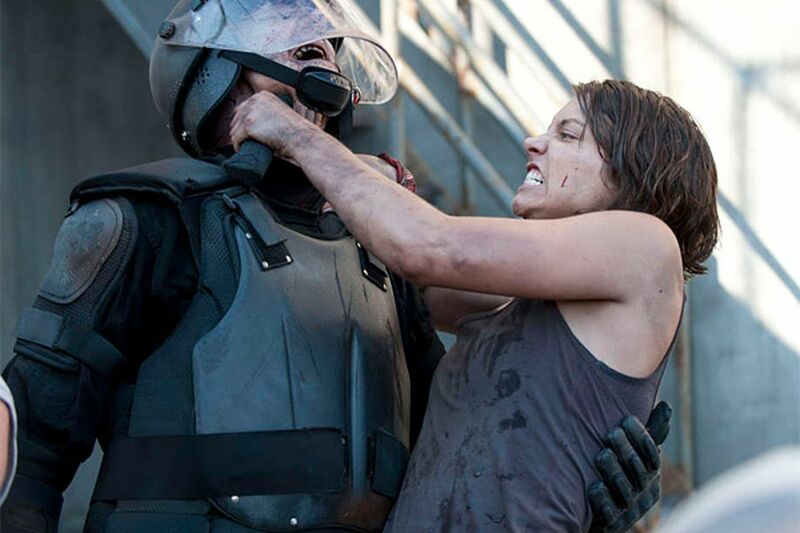 Lauren Cohan is revealing the secret for dispatching large numbers of zombies in the most efficient manner. It's a technique that Maggie, her character on The Walking Dead, has perfected this season out of necessity, as the ravening biters have gathered in growing mosh pits by the perimeter fences behind which the human survivors have taken refuge. Periodically, Maggie and her besieged band must thin the zombie herds before they topple the ramparts. Because of Cohan, a doe-eyed Philadelphia native, many in The Walking Dead's massive fanboy base would willingly take a shift on the fence. Post-apocalyptic chicks are hot! Of course, things are not always what they look like - or sound like - on TV. On the phone from Georgia, where The Walking Dead is shot, Cohan has a rather melodic English accent, quite unlike Maggie's flat Mid-Atlantic intonation. Is she using the interview to practice for a future audition? Or has she adopted the accent to make the faux American stars of The Walking Dead - Londoner Andrew Lincoln (Rick) and Liverpudlian David Morrissey (the Governor) - feel more at home? Neither. "I'm like this Jersey girl who feels so English," she says. "It's an anomaly." You got that right. Not to mention confusing. Let's start at the beginning. The actress was born in Philadelphia of Scottish, Irish, and Norwegian stock. When her mother remarried, she took both the last name (Cohan) and the faith (Jewish) of her stepfather. She remembers her adolescence in Cherry Hill as pretty idyllic. "I had a white Huffy with neon-pink handlegrips," she says. "Swim team, Baby-sitters Club books, and going to Kmart in the summer because there was nothing else to do. My best friend, Margaret-Ann Kavanagh, and I built crazy rafts and cruised down the creek, which was probably sewage." When she was 13, her family moved to the United Kingdom, her mother's birthplace. Lauren felt like a hostage. "I was kicking and screaming," she says. "We have a picture of me outside the house in New Jersey. I think I'd been crying for three days." The transition to life in Surrey outside London turned out to be surprisingly smooth. "There was myself and one other American kid at the school," she says. "We were sort of a novelty. Everyone was obsessed with My So-Called Life at the time, and everybody wanted to know if that was what it was really like in America." Are we cool on Cohan's binational upbringing? Let's get back to killing zombies. No one works the fence like Maggie, using her sharpened cane to turn out the lights on one zombie after another like some cranked-up picador. actual conversations with all of them," she says, laughing. "You can't see it, but I'm whispering to them, 'You need to come closer'; 'Growl a little more.' "
Occasionally, the grim survivalist tone of The Walking Dead will take its toll on a girl. "It goes in waves," she says. "In Season 2, I had a lot of bad dreams because it was all new. In Season 3, I really only got affected when I had to cut the baby out of Lori [the character played by Sarah Wayne Callies]. "I literally had this overwhelming wave of grief when we finished," says Cohan, 31. "I know it's not real and that people will get up and walk away. But the things we hope to make people feel are there and the body doesn't know the difference." Cohan comes to South Jersey to visit her many relatives every chance she gets. Even then she has to be vigilant about The Walking Dead's strict secrecy protocols. "My aunt and uncle are always trying to pry plotlines out of me," she says, laughing. "They think I don't know that's what they're doing. I intentionally feed them red herrings. "They'll say, all innocent, 'We're so glad Glenn [Maggie's boyfriend, played by Steven Yuen] is going to be alive!' I say, 'Ooh, I don't know about that.' "
Devious and deadly! The fanboys must be drooling.